Found 5 blog entries for April 2014. Thursday, April 24th, 2014 at 4:37am. It is an exciting opportunity to purchase Lake Michigan real estate and provide your family with a place to go relax and enjoy the beautiful setting that is the Western Michigan coast. However, if you just purchase a home or cottage and don’t make any changes to it, you might just feel like you are renting from someone else. In order for your vacation property on Lake Michigan to really feel like a second home, you will want to add some personal touches that represent you and your personality. Tuesday, April 15th, 2014 at 9:04am. Purchasing waterfront property is a dream come true for most people but it also comes with its share of risks. One of the risks of living on a lake, river, or other water source is the exposure to potential floods. Rising water tables, wind-driven waves, worsening weather patterns and spring thaws all contribute to a growing increase in the need for flood insurance. A standard homeowners policy excludes any coverage for a loss resulting from a flood. A water and sewer backup endorsement may be purchased and will provide some coverage in the event that your sump pump fails or can’t keep up but if any ground water enters the residence from another source, there will be no coverage. Friday, April 11th, 2014 at 9:58am. For sport fishermen, Lake Michigan is one of the most attractive spots in the country to get a line wet and see what they can catch. As one of the largest lakes in the world, Lake Michigan is home to a wide variety of species and can be receptive to many different types of fishing. For the uninitiated, taking on the vast waters of this Great Lake can be quite intimidating. However, once some local knowledge is gained, there certainly are fish to be found. Wednesday, April 9th, 2014 at 5:56am. 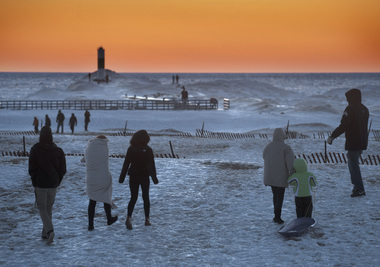 The Holland-Grand Haven area fares well in a national report on Americans' health and happiness - ranking No. 1 for physical health and access to basic necessities. The rankings are included in the Gallup Healthways 2013 State of American Well-Being report. Monday, April 7th, 2014 at 8:38pm.